One of the longstanding debates in gaming circles is which of the core Dungeons & Dragons classes are least necessary to the game. Few people challenge the place of either fighting men¹ or magic-users on the roster. Indeed, Steve Jackson’s first role playing game was built around just those two archetypes, which isn’t surprising given that they neatly encapsulate the two poles of the swords and sorcery genre. Consequently the discussion tends to boil down to whether one has more enmity for the thief or the cleric. Now… the thief class takes a lot of flak in spite of the enduring appeal of characters like Robin Hood and Bilbo Baggins. Yet not only was it a latecomer that wasn’t even in the original three “little brown books” that made up the original “White Box”rule set, but its system of skills and abilities was seen as taking away from actions that everyone tended try during the earliest game sessions.² For instance, fighting men might take a stab at being stealthy by removing their armor and then scouting ahead for the party. When the thief class came along with an explicit chance to “move silently”, a lot of people leaped to the conclusion the other classes couldn’t attempt such a thing anymore. This made for some hard feelings, and fixing the design issues implied by this class’s existence is such a hassle that maybe it’s best to just drop it altogether! In the same vein, the cleric class comes in for a good deal of grief in spite of the fact that it was one of the original three classes in the game. In more recent editions, people don’t mind having one in the party, but they can’t always find someone willing to play one. (Few people want to be relegated to the role of a glorified medic; they want to get out front and do stuff, not just play a support role!) But really, the original class is downright odd. They can’t use edged weapons for some reason and they have a bizarre adaption of the Vancian magic system with the effects drawn largely from biblical accounts. They’re just weird… and the archetype doesn’t turn up in fantasy literature to anything near the same frequency as the others classes. For a lot of people, the cleric is the obvious choice for the odd man out. Reading Poul Anderson’s The High Crusade, however, it quickly becomes apparent that, if you’re going to be faithful to the game’s medieval roots, then the two core classes would have to be the fighting man and the cleric– a stark difference from Steve Jackson’s The Fantasy Trip. This just isn’t in line with how most people view the game, though. This is ironic given that the earliest iterations of what would become Dungeons & Dragons were actually a fantasy supplement to the medieval miniatures rule set Chainmail. It was an explicit goal of those rules to inspire people to gain a greater familiarity with the actual history of the Middle Ages.³ This aspect of the hobby gradually faded into obscurity when fantasy gaming took on a life of its own. Of course, the less medieval elements you incorporate into your game setting, the less sense the cleric is going to make. Fans of the oft-maligned class will be gratified to discover that this The High Crusade is actually narrated by a cleric. Purists, on the other hand, will be disappointed to see that he wields a battleaxe during the first chapter. At first glance, it’s hard not to jump to the conclusion that this title made Gary Gygax’s “Appendix N” book list because of its likely part in inspiring the game’s tendency to fuse science fiction and fantasy elements together. Indeed, the cover looks like something straight out of Expedition to Barrier Peaks. But Poul Anderson has done much more than provide an unusual theme for a dungeon adventure. He’s turned the standard alien invasion on its head by having the humans thwart the would-be oppressors on first contact. An alien scout vessel is quickly overrun… by Medieval Englishmen! When they get their hands on high tech weaponry and figure out what they can do with it, their first thought is to gather up the entire village, board the space craft, and take an extended vacation that would include invading France and taking back the Holy Land! “What are Christians?” he asked. Dumbfounded, I thought he must be feigning ignorance. As a test, I led him through the Paternoster. He did not go up in smoke, which puzzled me. “It is no such heathen thing!” I said indignantly. I started to explain the Trinity to him, but had scarcely gotten to transubstantiation when he waved an impatient blue hand. It was much like a human hand otherwise, save for the thick, sharp nails. Actually, the Wersgor domain was like nothing at home. Most wealthy, important persons dwelt on their vast estates with a retinue of blueface hirelings. They communicated on the far-speaker and visited in swift aircraft of spaceships. Then there were other classes I have mentioned elsewhere, such as warriors, merchants, and politicians. But no one was born to his place in life. Under the law, all were equal, all free to strive as best they might for money or position. Indeed, they had even abandoned the idea of families. Each Wersgor lacked a surname, being identified by a number instead in a central registry. Male and female seldom lived together more than a few years. Children were sent at an early age to schools, where they dwelt until mature, for their parents oftener thought them an encumbrance than a blessing. Yet this realm, in theory a republic of freemen, was in practice a worse tyranny than than mankind has known, even in Nero’s infamous day. The situation in The High Crusade is very similar to the premise of GDW’S war game Imperium. While not originally a part of the Traveller line, the events of the game were later retconned into the role playing game’s official future history. Granted, the tale depends on a great many implausibilities, but the fact that there’s an element of truth here is the key to what makes it so funny. You see, it’s not just that medieval people can be interesting if they are portrayed a little more faithfully to their real life character and attitudes. It’s that they may even have been better than us in ways we rarely contemplate. And maybe the things that seem most strange about them now were actually perfectly reasonable cultural adaptions that addressed the essential problems of their time! Whether you agree or not, it’s certainly an audacious premise– exactly the sort of mind blowing concept I look for in a good science fiction novel. Fans of science fiction and fantasy too often embrace just the surface elements of their respective genres. Whether it’s aliens in rubber suits or historical characters that have barely disguised twentieth century world views, there is a tendency to dumb things down to a level where it becomes glorified dress up. Steampunk, for instance, has a fairly aggressive tendency in that direction.⁴ What’s more disappointing, however, is when a lazy ignorance of fundamental cultural differences gives way to an outright contempt for the historical antecedents. A recent episode of Doctor Who provides a good bad example. Matt Smith practically spits out the words in his 2012 Christmas special: Oh dear me, how very Victorian of you. His hatred of an entire period of history is taken as self-evident and is not even supported in the context of the episode’s events. It not only falls flat, but it is incoherently sanctimonious. It doesn’t have to be this way. The fact that Poul Anderson could make taking the opposite tack look so effortless is a big part of why he deserves his title as Grand Master of Science Fiction. This book is just as fresh and exciting as it was when it came out over fifty years ago. It is rightly regarded as a classic of the field. The fact that it graphically illustrates why interstellar feudalism is such a good fit for Traveller‘s Third Imperium setting only makes it better. ¹ This slightly more archaic term is used both in The High Crusade (see the beginning of chapter six) and also in the original version of Dungeons & Dragons. Later editions of the game would use the slightly watered down “fighter” in its stead. ² See “The Trouble with Thieves” by James Maliszewski in Knockspell #2 for a good run down on the arguments surrounding the introduction of the thief class. the wargamer sufficiently to start him on the pursuit of the history of the Middle Ages. Such study will at least enrich the life of the new historian, and perhaps it will even contribute to the study of history itself.” — Chaimail by Gary Gygax and Jeff Peren, page 8. ⁴ See I’ll be Holmes for Christmas, or Sherlock Holmes and the case of the missing holiday for more on that. Note: The High Crusade was adapted into a war game in issue #16 of Ares Magazine. A Board Game Geek review is here. There are few things more tedious than seeing 20th century perspectives inserted into quasi-11th century historical settings. It’s ignorant, incoherent, deceptive, often propagandistic, and intrinsically offensive to anyone with even a modicum of respect for history. Reading all the quasi-medieval fantasies without the most quintessentially medieval institution was what originally inspired me to write Summa Elvetica. A small point: Bilbo was only nominally a thief, and the race-as-class halfling build (hide outdoors/bonus to ranged) makes more sense for Robinhood than the Thief class. As for no one liking the Thief, it makes sense in retrospect if you look at the Thief as the most primordial form of 3e. Also, hell, yeah! 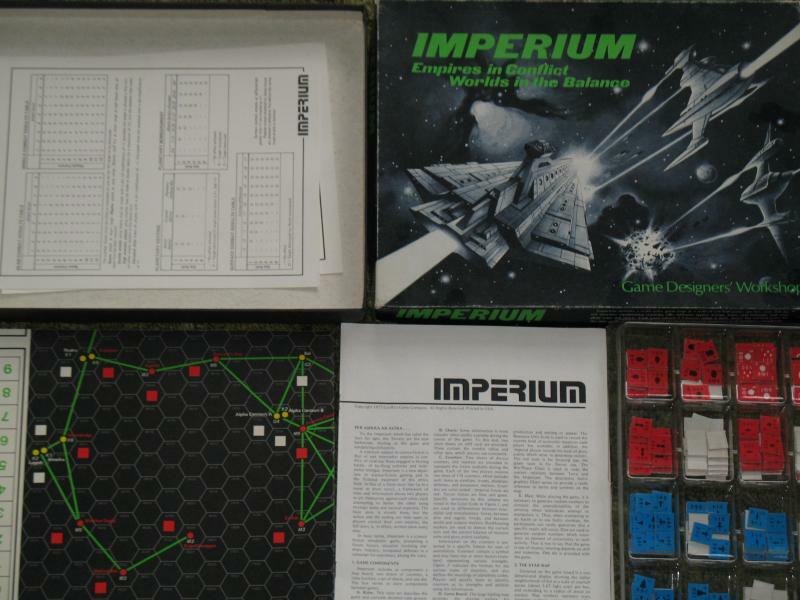 I loved Imperium as a kid! Anyway, I need to see if they’ll have some Poul Anderson at the library sale this weekend. You’ve got me sold on him. “Thief as the most primordial form of 3e” — Woah… that’s almost a cthulian level horror. I can’t unthink it! Clerics get a bad rap in FRP BECAUSE they’re turned into medics. That’s neither necessary nor useful for many games, as vast quantities of available healing turn RPGs into reward-based pablum (as in 4e D&D). I haven’t read the book in decades, but it was hilarious. I understand Uwe Boll made a movie of it (with John Rhys Davis), it is supposed to be quite bad. I’ve never been able to find a copy. Yeah, gotta nip that in the bud by not giving clerics any spells at first level. By the same token, thieves are neither rogues nor swashbucklers and are rightly limited to d4 hit dice lest they cease from their skulking and connivery. If 3e tends to be every many for himself (“look at me, I’m a one-man army”) then calling the thief the primordial form makes a lot of sense. Thieves are the quintessential loners out only for themselves. And if 1e is all about cooperation, you COULD make an argument that the cleric is the primordial 1e character (if the cleric isn’t reduced to a medic). In NetHack, the player steals from those crazy shops that are everywhere in the dungeon. It is insanely fun to outwit those guys… and everyone does it regardless of class. In B/X D&D, the thief not only steals primarily from the player characters (there are no “Magic Shops” in the dungeon and in any case, the other players are easier to pick on than the NPC’s! ), but they also look out for any opportunity to betray the party and get back to town with both the treasure and all the experience points. Thieves make it to third level before everyone else not just because the experience requirements are less; they play waaaay more cautiously than the other classes as well, not to mention more self-interestedly. I am a big fan of the cleric and the thief and have argued before that opposition to them is based on misunderstanding their role. How are their roles more properly understood, Rick? The thief is there to eliminate obstacles (traps, tricks, lone sentries) and help the party avoid ambushes, find the enemy, etc. I have articles about it at my blog – I can post links if you wish (I tend to not spam blog links without checking first! ).